"My name is Kate Burkholder and I've been the police chief of Painters Mill for about three years now. I was born here to Amish parents in a one-hundred-old farmhouse set on sixty acres of northeastern Ohio's rich, glaciated soil. I grew up Plain. Up until the age of fourteen, I was a typical Amish girl--innocent, God-loving, content in the way most Amish children are ... All of that changed on a postcard-perfect summer day when fate introduced me to the dark side of human nature. I learned at a formative age that even on perfect, sunny days, bad things happen." In this Linda Castillo mystery, Kate Burkholder has been asked by State Agent John Tomasetti to consult on a case involving three missing Amish teenage girls. They come from different communities in Ohio; they didn't know one another; and they went missing months apart. But Kate and Tomasetti think their disappearances might be related. 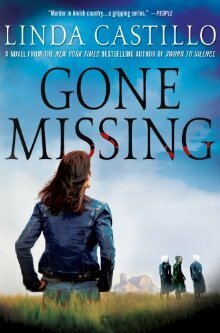 Then one of the girls turns up dead, and a fourth girl goes missing--a girl that Kate knows personally. This is a good mystery. But it's the Amish setting I like best: their rules and restrictions, family values and faith, and the way they choose to not be a part of the modern world. Because she was raised Amish, Kate understands them; but because she chose to leave their community when she was eighteen, she's no longer welcome among them, which makes her a nicely complicated character. In her job as police chief, she tries to bridge the gap between the Amish and the English, which isn't easy. And her growing relationship with Agent Tomasetti is another fun complication. It's all these layers and complications that make this mystery series so good. Jack Martel's mother takes him camping at the Seawall Campground on Mount Desert Island, Maine, but when he wakes up in the morning his mother is gone. 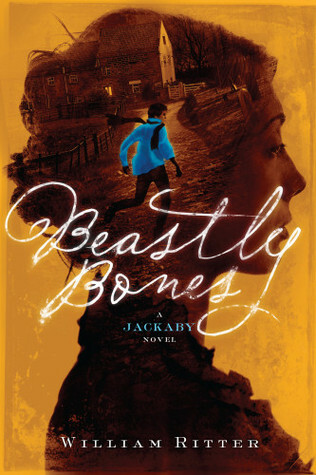 Jack looks for her around the campground; he takes the Island Explorer bus around the island in search of their rental car; and he walks every inch of Bar Harbor in the hopes of spotting her in one of the shops or restaurants. What he doesn't do is tell anyone that she's missing because it's not likely that she's been in an accident or is hurt. "The likeliest possibility was that she had just gone off--again." 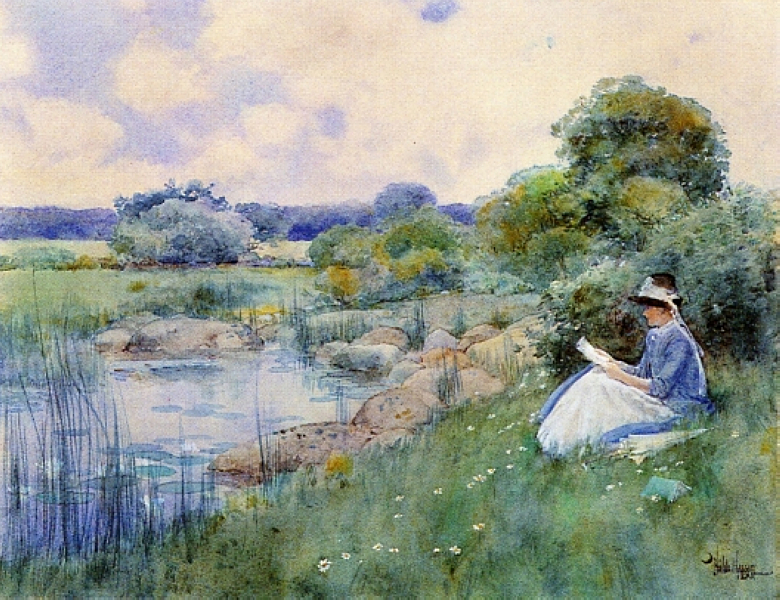 It fills another category in my Reading New England Challenge! Winter has come to Shepherd, New Hampshire. Twelve-year-old Nicky Dillon and her father are snow-shoeing in the woods near their home when they hear the cry of an abandoned newborn. They get the baby girl to the hospital in Mercy just in time to save her life. And they think that's the end of it. But it's not; it's only the beginning. I probably would never have read this book except I needed a novel set in New Hampshire for my Reading New England Challenge. So I was a little surprised by how much I enjoyed it. Nicky is an engaging narrator. She and her father are still healing from the personal tragedy that struck their family two years earlier; it's why they moved to New Hampshire from New York in the first place. But the baby they find in the woods stirs up memories for both of them...and entangles their lives with that of the baby's young mother, changing all of them. This is a moving story of love and grief and family, and of consequences and hope. 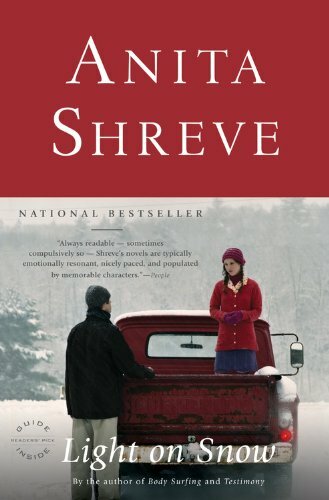 I like the way Anita Shreve weaves together the Dillons' past and present. And I got caught up in the young mother's story. I also liked the New Hampshire setting, especially the Dillons' secluded old farmhouse and the quiet beauty of the snowy woods. It makes for a perfect winter read. Just make a cup of hot chocolate, grab an afghan, curl up on the couch, and enjoy. It's another great reading bingo card from Unruly Reader! There are a lot of fun squares, and a few challenging ones, too. The Children's Classic, Beach Read, Adventure and Twisted squares will be the easiest to fill; finding books I want to read for Music, Spies, and Suburban Ennui might be a little trickier. 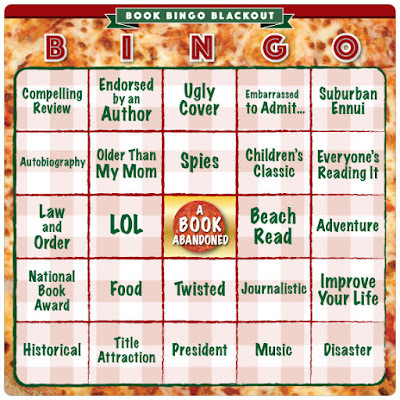 But going for bookish bingo blackout every year is one of my favorite things. Print out a card and play along! It's A LOT of bookish fun. "The plan, as I had fantasized for the last six months, was to drive out to Wyoming and have a brave adventure with a bunch of strangers that would totally change not just my life, but my entire personality. The plan was to set out alone into the world, conquer it, and return home a fiercer and more badass version of myself. The plan did not include anybody but me -- especially not, of all people, Jake." Helen Carpenter, who is thirty-two and has been divorced for a year, decides it's time to change her life. So she signs up for an extreme wilderness survival course in Wyoming. The other participants are all college students. Then there's Jake -- her younger brother's best friend who's had a crush on her for years-- who has also signed up for the course. But Helen isn't interested in Jake; she just wants to prove that she can survive on her own. 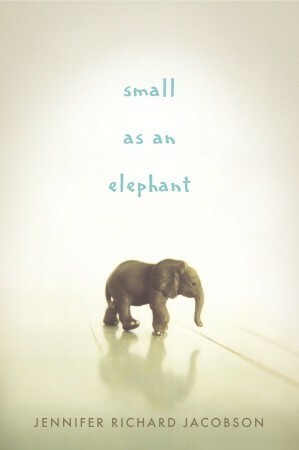 And maybe find a little happiness along the way. Helen is a funny and easy-to-relate-to narrator, although there were times when I wanted to take her by the shoulders and shake some sense into her. And I really liked Jake, although the relationship drama between him and Helen sometimes felt a little contrived and unnecessary ... and also a tad predictable. The outdoor adventures they have--all the mishaps, successes, and lessons learned along the hiking trail--is what I liked best...and why I'm recommending this book. 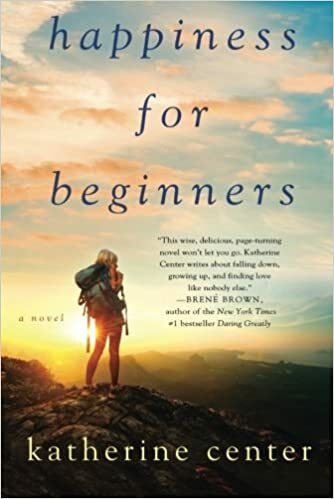 happiness for beginners by Katherine Center is an entertaining and happy novel, and a perfect read to start off the new year. 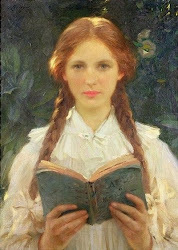 I originally intended on making no bookish goals this year; instead I dreamed of being a free-range reader, choosing my books solely according to whim and whimsy. 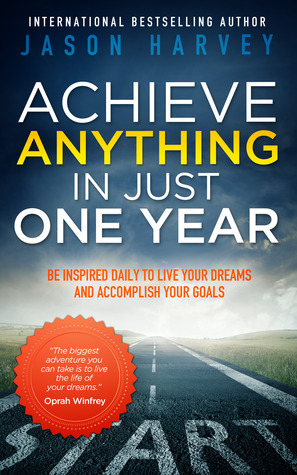 No lists, no commitments, no book clubs, no challenges, nothing. Just free reading. But then I saw the Reading England 2016 Challenge hosted by Behold the Stars, and it sounded like fun, and there are books that I want to read this year that I knew would fit this challenge perfectly; so, I found myself discarding my original plan and signing up without a second thought. 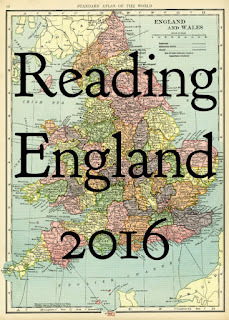 It's a straight-forward challenge: read a different book for every county in England. Only there are 4 levels to choose from, so if you don't want to read 39 books you don't have to. I'm shooting for Level 2: 4-6 counties. I've already started reading my first book: A Little Princess by Frances Hodgson Burnett, which is set in London. It's one of my favorite children's books and a great first read of 2016. 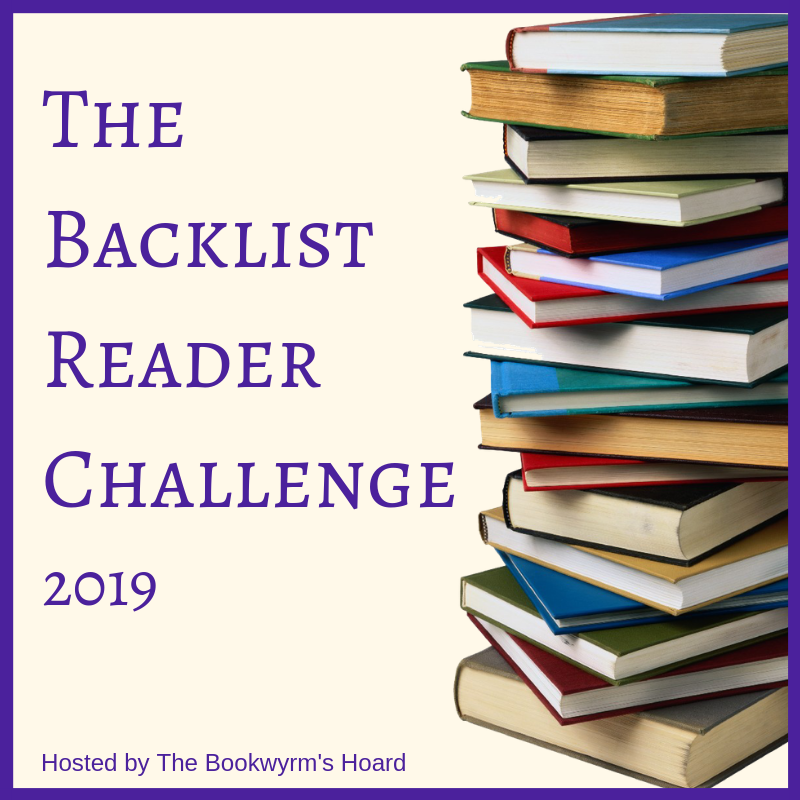 Then, because I found myself in a book challenge kind of mood I signed up for the Reading New England Challenge hosted by Lory at Emerald City Books as well. 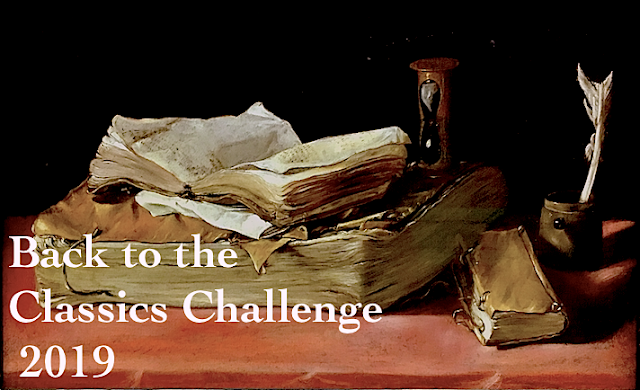 For this challenge I'm hoping to complete the Six State Challenge: read at least one book that represents each New England state. I'm a little worried about finding a book set in Rhode Island, but the other states should be fairly easy. Between these two challenges I should be very well-traveled by the end of 2016.